Deb Sokolow is up to her usual antics: creating witty, intricate and politically resonant artwork. As the title—simply “Men”—suggests, the subject is a collection of misters who all possess narcissism, Machiavellianism and psychopathy, known collectively as the “dark triad.” By intersecting the factual matters and occasional fictions of those like Vladimir Putin, Frank Lloyd Wright and Donald Judd, the artist is at her forte, taking diabolical personalities and their mythologies to task through great humor and real anxiety. With a variety of sly drafting and sculptural methods, Sokolow subverts the gaze these men are used to controlling. In examining their historical notoriety, they begin to slip into doubt and suspicion against the probable. For instance, some cursory fact-checking on Sokolow’s claims proves that Kim Jong-un is obsessed with Michael Jordan (not, necessarily Dennis Rodman), but had there really been plans to kidnap him? Maybe. Beyond their provocative narratives, Sokolow’s drawings are precise and considered. Using a variety of minimalist-inspired linework, color fields and diagramming, her methods are also met with three-dimensional folds that give way to architectural renderings, further blurring the lines of the two-dimensional schema that conventional drawing often binds itself to. 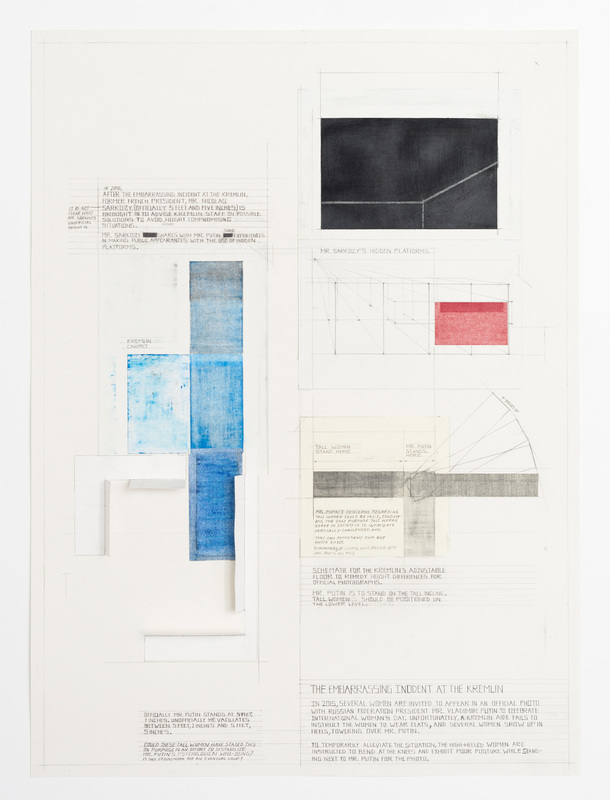 Her diagrams in particular are well within vernacular, creating a shifting navigational tool for her evidentiary aims.